Today, the Sesquicentennial of American Independence Commemorative Silver Half Dollar Coin remembers Mr. Lee’s erroneous plan of 239 years ago. It was at this time that he abandoned the cause to which he had so solemnly devoted himself. He was wanting in the hour of trial! At the touch of misfortune, like the angel’s spear, the disguises of cowardice and treachery fell away, and the pages upon which he recorded his own condemnation, vindicate his claim to a high place upon that list of traitors, of whom — to the sorrow and shame of humanity be it spoken — Judas was not the first, nor Benedict Arnold the last! While the Continental Congress were denouncing their most solemn vengeance in retaliation for any injury which he might receive at the hands of his captors — while Washington, forgetting the insults and injuries which had led to his misfortunes, was straining every nerve in his behalf, and urging his requests upon Congress with constant zeal and sympathy — He WAS PLANNING FOR THE ENEMIES OF AMERICA, THE RUIN OF THE CAUSE! MR. LEE’S PLAN—29th March, 1777. “As on the one hand it appears to me that by the continuance of the War America has no chance of obtaining the ends She proposes to herself; that altho by struggling She may put the Mother Country to very serious expense both in blood and Money, yet She must in the end, after great desolation havock and slaughter, be reduced to submit to terms much harder than might probably be granted at present — and as on the other hand Great Britain tho’ ultimately victorious, must suffer very heavily even in the process of her victories, evry life lost and evry guinea spent being in fact worse than thrown away. “I do this with the more readiness as I know the most generous use will be made of it in all respects — their humanity will incline ’em to have consideration for Individuals who have acted from Principle and their good sense will tell ’em that the more moderate are the general conditions; the more solid and permanent will be the union, for if the conditions were extremely repugnant to the general way of thinking, it wou’d be only the mere patchwork of a day which the first breath of wind will discompose and the first symptoms of a rupture betwixt the Bourbon Powers and Great Britain absolutely overturn — but I really have no apprehensions of this kind whilst Lord and General Howe have the direction of affairs, and flatter myself that under their auspices an accommodation may be built on so solid a foundation as not to be shaken by any such incident — in this persuasion and on these principles I shall most sincerely and zealously contribute all in my power to so desirable an end, and if no untoward accidents fall out which no human foresight can guard against I will answer with my life for the success. “From my present situation and ignorance of certain facts, I am sensible that I hazard proposing things which cannot without difficulties be comply’d with; I can only act from surmise, therefore hope allowances will be made for my circumstances. “I have at the same time the comfort to reflect, that in pointing out measures which I know to be the most effectual I point out those which will be attended with no bloodshed or desolation to the Colonies. As the difficulty of passing and of re-passing the North River and the apprehensions from General Carlton’s Army will I am confident keep the New Englanders at home, or at least confine ’em to the East side the River; and as their Provinces are at present neither the seat of Government strength nor Politicks I cannot see that any offensive operations against these Provinces would answer any sort of Purpose — to secure N. York and Rhode Island against their attacks will be sufficient. “On the supposition then, that General Howe’s Army (including every species of Troops) amounts to twenty or even eighteen thousand men at liberty to move to any part of the Continent; as fourteen thousand will be more than sufficient to clear the Jersey’s and take possession of Philadelphia, I would propose that four thousand men be immediately embarked in, transports, one half of which should proceed up the Patomac and take post at Alexandria, the other half up Chesepeak Bay and possess themselves of Annapolis. “They will most probably meet with no opposition in taking possession of these Posts, and when possessed they are so very strong by nature that a few hours work and some trifling artillery will secure them against the attacks of a much greater force than can possibly be brought down against them — their communication with the shipping will be constant and sure— for at Alexandria Vessels of a very considerable burthen (of five or six hundred Tons for instance) can lie in close to the shore, and at Annapolis within musket shot — all the necessaries and refreshments for an Army are near at hand, and in the greatest abundance — Kent Island will supply that of Annapolis and every part on both banks of the Patomac that of Alexandria. “These Germans are extremely numerous, and to a Man have hitherto been the most staunch Assertors of the American cause; but at the same time are so remarkably tenacious of their property and apprehensive of the least injury being done to their fine farms that I have no doubt when They see a probability of their Country becoming the seat of War They will give up all opposition but if contrary to my expectations a force should be assembled at Alexandria sufficient to prevent the Corps detached (hither from taking possession immediately of the place, it will make no disadvantageous alteration, but rather the reverse — a variety of spots near Alexandria on either bank of the Patomac may be chosen for Posts equally well calculated for all the great purposes I have mentioned — viz — for the reduction or compulsion to submission of the whole Province of Maryland for the preventing or intimidating Virginia from sending aids to Pensylvania—for in fact if any force is assembled at Alexandria sufficient to oppose the Troops sent against it, getting possession of it, it must be at the expense of the more Northern Army, as they must be composed of those Troops which were otherwise destined for Pensylvania — to say all in a word, it will unhinge and dissolve the whole system of defense. I am so confident of the event that I will venture to assert with the penalty of my life if the plan is fully adopted, and no accidents (such as a rupture betwixt the Powers of Europe) intervenes that in less than two months from the date of the proclamation not a spark of this desolating war remains unextinguished in any part of the Continent. Such was the scheme of treason which Charles Lee, Major General, second in command in the American army of the Revolution, took “the liberty of offering to the consideration of his Lordship and the General, His Majesty’s Commissioners, Lord and Sir William Howe! Its form and character do not admit the supposition that he had been tampered with, solicited, or approached in any way on the subject. It must have been the voluntary offering of cowardice, eager to purchase safety by treachery, and thus to open the way back to allegiance and protection! He had evidently regarded himself as “the Palladium,” and with his own capture had lost all hope for the success of the Americans. 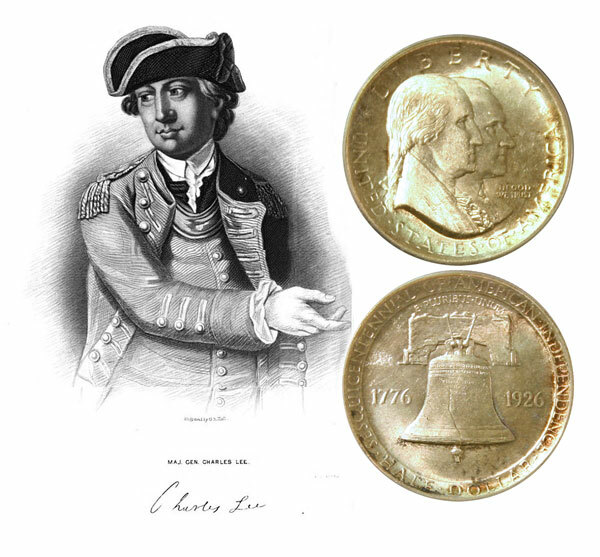 The Sesquicentennial of American Independence Commemorative Silver Half Dollar Coin shows with an artist’s image of Charles Lee.